Blumenthal is senior editor of the Grayzone Project. He just wrote the piece “Congress welcomes an actual fascist as Nazi violence rages in Ukraine,” which includes video of his questioning and background information. 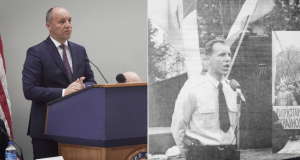 Blumenthal writes: “While racist violence raged through Ukraine, punctuated by a wave of attacks on Roma encampments by the state-funded C14 neo-Nazi militia, Congress played host to an actual Ukrainian fascist. He was Andriy Parubiy, and besides being the proud founder of two Nazi-like parties — the Social-National Party and the Patriot of Ukraine — he was the speaker of Ukraine’s parliament. “During a meeting hosted by the American Foreign Policy Society inside the Senate, I seized the chance to ask Parubiy’s hosts why they were welcoming a figure who was so central to the extremism overtaking Ukrainian society. I also put the question to Michael Carpenter, a former Pentagon official who helped deepen the U.S. relationship with post-coup Ukraine during the Obama administration. “The responses I received reflected a semi-official policy of denying the very existence of Ukraine’s far-right plague in order to turn the heat up on Moscow. “The Ukrainian lawmaker appeared on a panel alongside fellow speakers of Eastern European parliaments eager to join the U.S.-NATO crusade against Russia in exchange for handsome aid packages. At the top of the agenda was stopping the Nord Stream 2 pipeline between Russia and Germany, a project viewed in Washington as an existential threat to U.S. economic leverage over Europe.